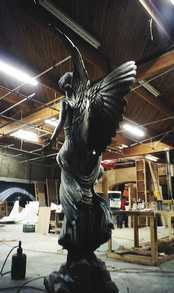 Directly carved in polystyrene rigid foam, the angel was a fun but challenging project. A challenge because of the small amount of time allotted for its execution. It was carved and painted in 9 days. The drapery was a lot of fun. 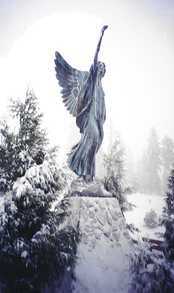 As can be seen from the 'post card' photo, she came to rest in a snowy location. A real on actually. I snapped this shot just after it was installed. It started to snow just as we finished.. It didn't stop snowing for 3 days.